By custom, leases in Québec go from 1 July to 30 June. A very high proportion of the dwellers in Montréal are renters — in 1998, over 250,000 people applied to have their telephone services hooked up at a new location for the 1st of July. In 1998, the BBC sent a film crew in to make a documentary of it all. The person who is moving treats all the helpers to meals. People usually get food delivered in or as take-away. The food is often pizza, submarines or fried or barbeque-sauce chicken from the Saint-Hubert chain of restaurants — food that doesn’t require a set-up kitchen or anything other than paper plates or plastic forks to eat. The beverages of choice are beer or Pepsi. Some people make firm plans to be away that week-end well in advance, so that they can’t get hit to help move somebody. The big party in Québec, Saint-Jean-Baptiste Day (aka Fête Nationale du Québec), has happened a week before and everyone has had his / her fun. But because Saint-Jean-Baptiste Day was a long weekend holiday, it also gave those who are moving a bit of an extra day to pack in advance as well. 1 July is also an official holiday, for Canada Day, so you can move without taking a day off work. If you’re booking a van for moving, or hiring actual movers, if you don’t do it in advance by at least three to six months, you may be out of luck. Many garage sales are held in advance by people wanting to lighten the load before moving, and at the end of Moving Day, many good quality freebies that people decided against moving can be found on the curbside. The narrow, curved exterior staircases typical in Quebec cities add to the challenge of moving. 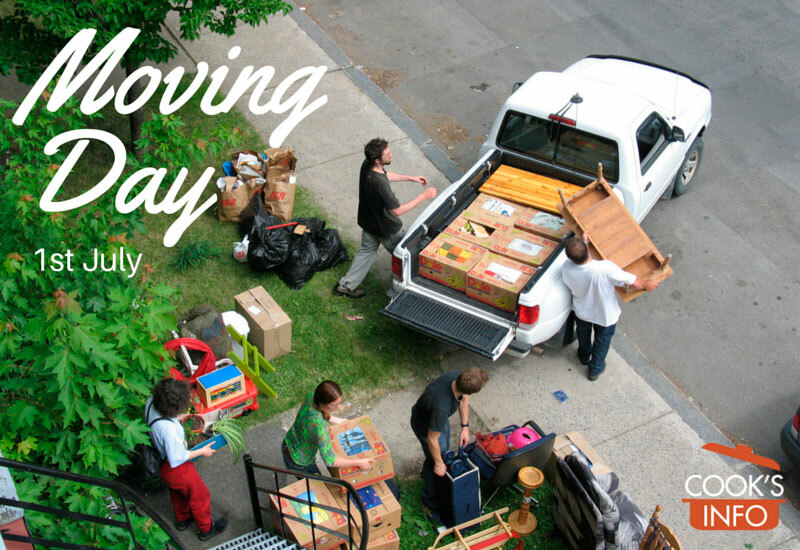 Moving Day used to be 1st of May. The idea dated from colonial times; the date prevented landowners from forcing tenant farmers from moving before the snows had melted. In 1973, the government moved it to the 1st of July. The advantages of the July date were that people already had the day off, the weather was likely to be better for the move, and, it allowed children to finish their terms in whatever school they had been in. The ritual of Moving Day is deeply set in Québec. In her 1945 novel, ‘Bonheur d’occasion’, Gabrielle Roy depicts the frenzy of the day in the Montreal suburb of Saint-Henri. In his 2004 comedy film ‘Premier juillet, le film’, Philippe Gagnon depicts three households caught up in the turmoil.